Strickland, Stephanie and Cynthia Lawson Jaramillo, V: Vniverse. In Electronic Literature Collection Volume 2. Electronic Literature Organization, 2011. 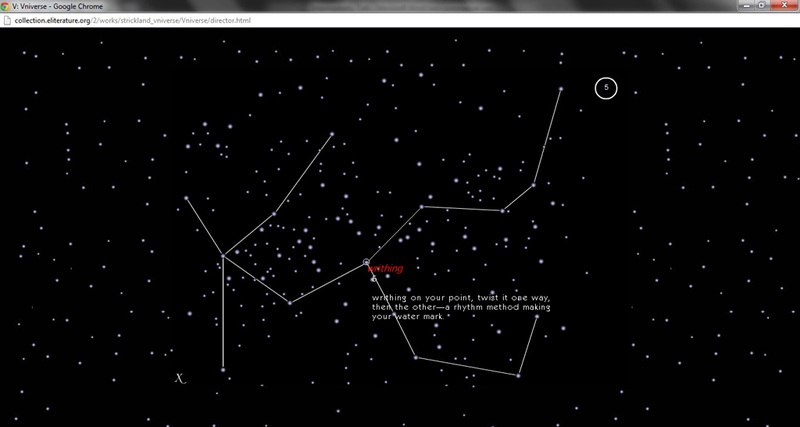 Philosophy has to bring its elements, which it receives from the sciences, into changing constellations. 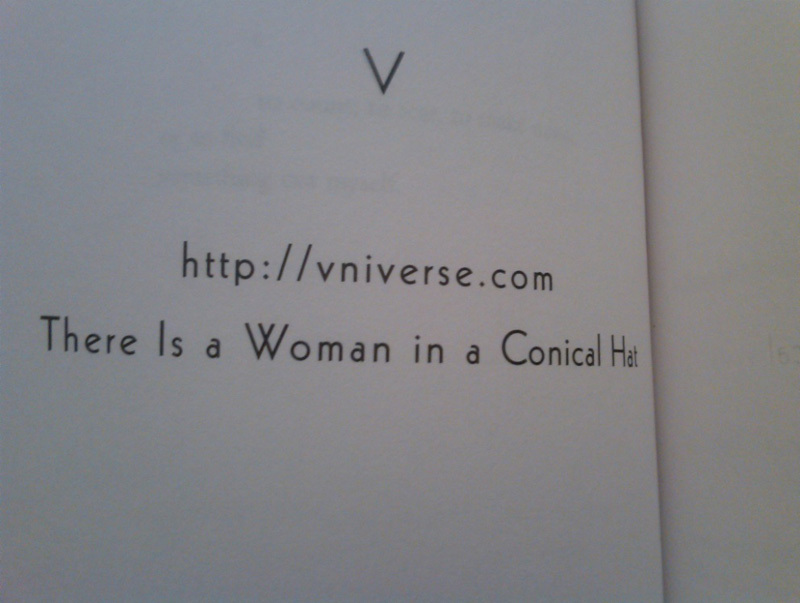 Poet Stephanie Strickland and web designer Cynthia Lawson Jaramillo's V: Vniverse — one of the oldest pieces collected in the Electronic Literature Collection, Volume 2 (February 2011) — has aged remarkably well. Despite the myriad ways in which digital cultural forms are prone to datedness and rapid obsolescence, V: Vniverse continues to be both conceptually compelling and aesthetically fresh well into the twenty-first century. Indeed, a new edition with an accompanying app for mobile devices is forthcoming from SpringGun Press in 2014. 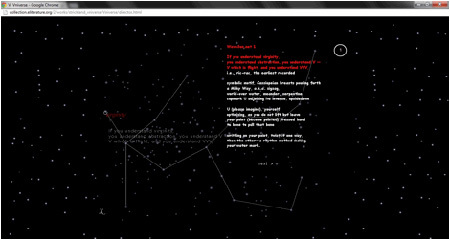 First published in 2002, V: Vniverse is one part of the tripartite and intermedial project V, the first work of poetry to exist simultaneously in print and on the Web as one work. The print volume of V, published by Penguin, consists of two halves — Losing L'una and WaveSon.nets — which are printed opposite of each other; the reader thus can enter the book through two different covers. 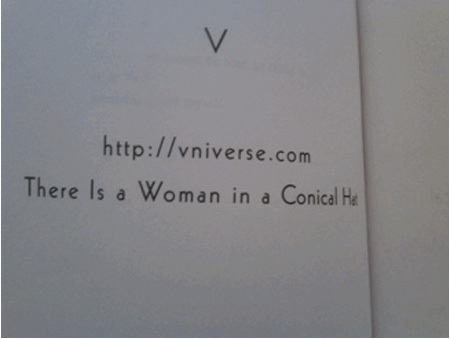 The two halves meet in the center (the "V" of the book), where the reader is directed to V: Vniverse's URL: http://vniverse.com/. As a remediation of the 47 poems that comprise the sonnet sequence called WaveSon.nets, V: Vniverse launches the contemporary long poem into the digital realm by breaking up the linearity of the "Son.nets" and redistributing them across dynamic constellational forms. The WaveSon.nets are — except for the last one — unrhymed fifteen-line poems, each consisting of three quatrains and a tercet. They have lines of variable length and often begin and end mid sentence as the units of sense carry over to the next piece. The word "WaveSon.net" is a kind of portmanteau that radically compresses the words "wave," "sonnet" and the suffix ".net" to constellate the natural, the poetic, and the technological — a configuration that is both thematized and performed throughout the work. 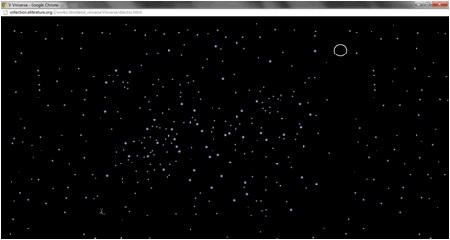 One begins V: Vniverse, WaveSon.net's digital version, with an inert screen that is "activated" by passing the cursor over one of the star-like points. 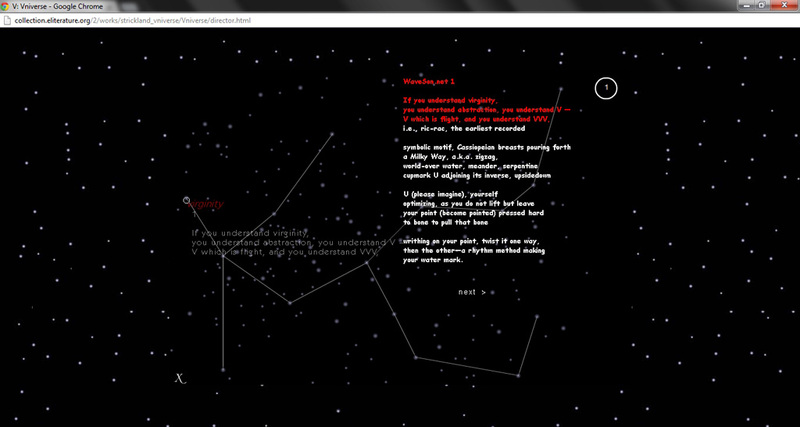 This action will cause the appearance of 1) a color-coded keyword (in this case, "virginity" in red font — a nod to mystic philosopher Simone Weil), 2) a constellational diagram (in this case, a headless swimmer), and 3) a tercet of poetry. This particular tercet reads: "If you understand virginity, / you understand abstraction, you understand V — / V which is flight, and you understand VVV." We might think of this tercet, which is the first of the sequence, as an introduction to "VVV" — what James Joyce might call "verbivocovisuality." We might liken this toggling, this compression and rarefaction, to the oscillating motion of a wave. One can further enrich the screen by passing the cursor over a different point, making another tercet appear as a kind of continuation of, counterpoint to, or marginal gloss on the reconfigured "sonnet." 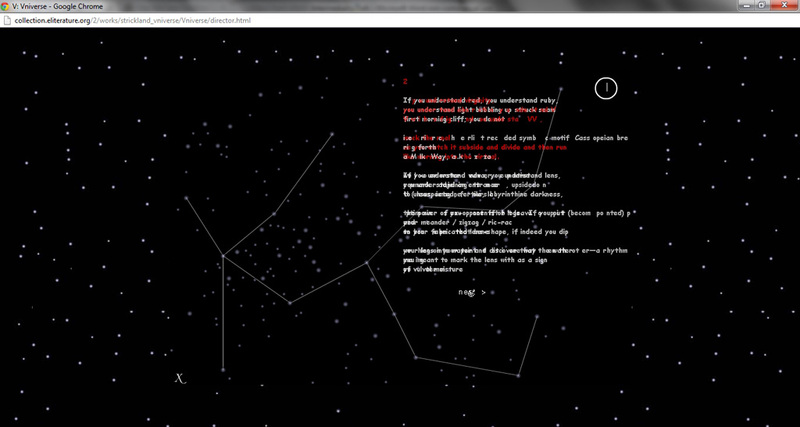 In this case, reading the new tercet's keyword as a continuation of the poem creates a significantly altered meaning. One possible reading of the last stanza would read, "writhing on your point, twist it one way, / then the other — a rhythm method making / your water mark. upsidedown." The word "upsidedown" potentially references the bottom half of a sine wave, but it also gestures from the screen back to the invertibility of Strickland's cleverly-conceived print codex. Clicking on "next" will make the next poem appear while the poem presently onscreen slowly dissolves, creating a limbic, palimpsestic space of both emergence and disappearance. The palimpsest is an apt trope for V: Vniverse's feminist ambitions and concerns — the "V" of the project indicates, among other things, an inverted witch's hat — since, as Susan Vanberborg notes, the palimpsest was for the modernist poet H.D. "a metaphor for the project of the woman poet writing through a patriarchal cultural history to recover traces of elided female myths and signs" (62). We can imagine the space of V: Vniverse as being filled with such traces to be recovered and to be recast, to borrow a phrase from Emily Dickinson, in "bright Orthography." 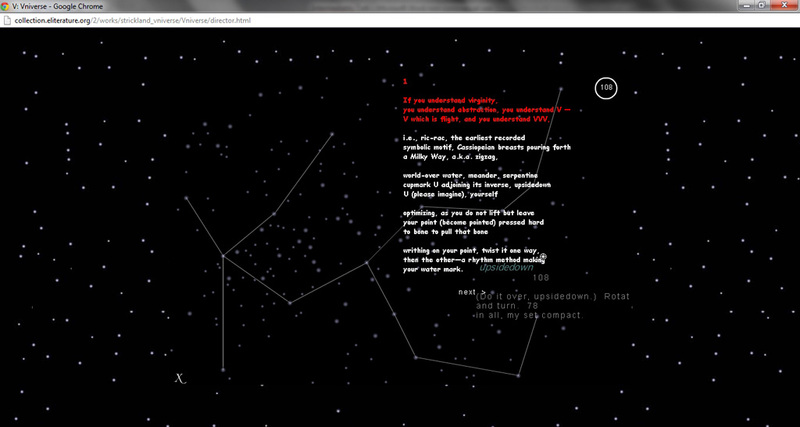 According to Strickland's explanatory essay "Making the Vniverse," "if you go to the Vniverse Web address, you find a dark space full of bright points, most easily read as stars." It is tempting then to read V:Vniverse as Valéry read Mallarmé's groundbreaking Un coup de dés: that is, as an attempt, through electronic means, "to raise a printed page to the power of the midnight sky." But Strickland importantly holds out the suggestion that the bright points might be "neurons," allowing us to understand the space of V:Vniverse as a bridge between mimetic image and conceptual schema just as it remarkably bridges page and screen, series and sequence, myth and science. In other words, V:Vniverse is intermedial, intergeneric, as well as inter-epistemological. In a curious 2003 review that appeared in the online journal Perihelion, Vivek Narayanan launched perhaps the most vociferous and misguided attack on V's intermediality. In his review, patronizingly titled "not nearly noVel enough," Narayanan egregiously conflates hypertext literature with electronic literature; but worse yet, in spite of rejecting Marshall McLuhan's fifty-year-old dictum that "the medium is the message," he polemically claims that he would have preferred V "if it had come packaged in a drab, photocopied cover in courier[sic] font and insisted on being a thoroughly linear text." For Narayanan, V:Vniverse is "redundant" — ostensibly because it draws on the already existing "WaveSon.nets" as its database. Narayanan attempts a balanced assessment and acknowledges Strickland's chops "as a basic modernist poet," but, with a finger-wagging confidence, he pronounces that "the book's attempts at philosophy fall flat." Against Narayanan, I argue that V's philosophical engagement is at its strongest and most provocative precisely in its digital incarnation. 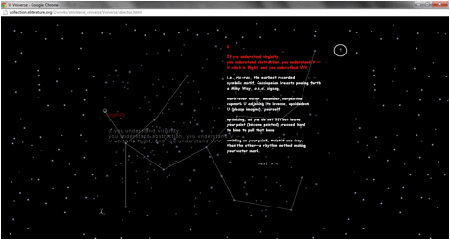 Far from being redundant or a "fetishiz[ation of] innovation" (Narayanan), V: Vniverse visually and interactively performs Theodor Adorno's theorization of the "constellation," which, according to Martin Jay, is "a juxtaposed rather than integrated cluster of changing elements that resist reduction to a common denominator, essential core, or generative first principle"(14-5). 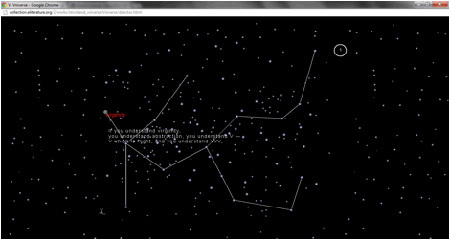 I argue that the flickering constellations of the V: Vniverse are informed by an Adornian philosophy, one which uses constellational thinking to "attain...what was necessarily excised from thinking." This is so because, as Adorno says in his Negative Dialectics, "constellations represent from without what the concept has cut away within: the 'more' which the concept is equally desirous and incapable of being" (162). Constellational thinking is particularly crucial for Strickland since a distinguishing characteristic of V:Vniverse — and V as a whole — is its engagement with a vast array of seemingly incommensurable sources of knowledge. In many ways this mirrors and pays tribute to the poetics of Simone Weil, to whom V is dedicated. As Sharon Cameron notes, "Weil's passages are exemplary precisely for their theatricalizing of kinds of knowledge (and points of view) that cannot be assimilated to each other, even though they might be presented as combinatory" (237). 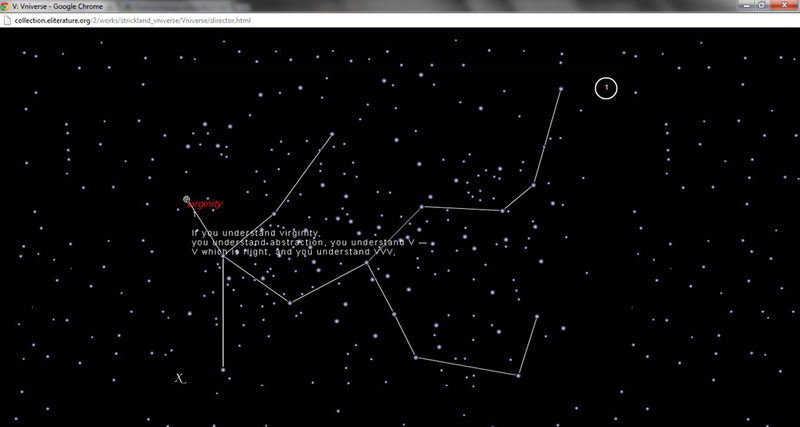 What better way to present combinatory, non-integrated or non-assimilable knowledge than through the constellation? We find in V allusions to writers such as Shakespeare, Joyce, Dickinson, Stein, and Tennessee Williams. But we also find a host of allusions that aggressively cross cultural, historical, and disciplinary boundaries — references to scientific and mathematical concepts and terms such as Cantor dust, fractals, quantum mechanics, central limit theorems, the Planck scale, phase space, and isomorphism; as well as references to English fairy tales and to Irish, Greek, Hindu, Islamic, and Vodun mythologies. In V:Vniverse, Strickland demonstrates what art historian Hal Foster has called "an archival impulse" — that is, a desire "to make historical information, often lost or displaced, physically present" and to "retrieve...[obscure sources] in a gesture of alternative knowledge or countermemory" (3-4). Such marginalized knowledges often involve witchcraft, possession, and divination — practices which were supposedly repressed by the Enlightenment. The bibliography at the end of WaveSon.nets lists texts such as Maya Deren's Divine Horsemen, and the accompanying title of V:Vniverse is "There is a Woman in a Conical Hat," a brilliant anagrammatic backronym of the word "witch." If V:Vniverse positions itself as an interface to a counter-archive of heterodox knowledge, it also suggests the embodied activity of what performance scholar Diana Taylor calls a "repertoire," that is, a "non-archivable system of transfer" in expressive culture (xvii). In the paratextual preface in the ELC, V2, Strickland calls V:Vniverse a "textual instrument"; it is, in other words, a device to be played and performed, an instrument — I would like to think — that toggles back and forth between scientific and musical, an instrument against what Adorno might call "instrumental rationality." Because V:Vniverse demonstrates the ways in which the archive and the repertoire interpenetrate one another in a digital age, it seems just as relevant in 2013 as it was in 2002, and it has an elegant visual style that can nicely weather the changing fashions of graphic design. There is a woman in a conical hat. or a broom. Or an axle-tree. Or a mill wheel grinding. timely, and you know her: Green, Great Circle, Noon. Strickland ends her inquiry with two more questions: "Or is the body not in the verses at all? 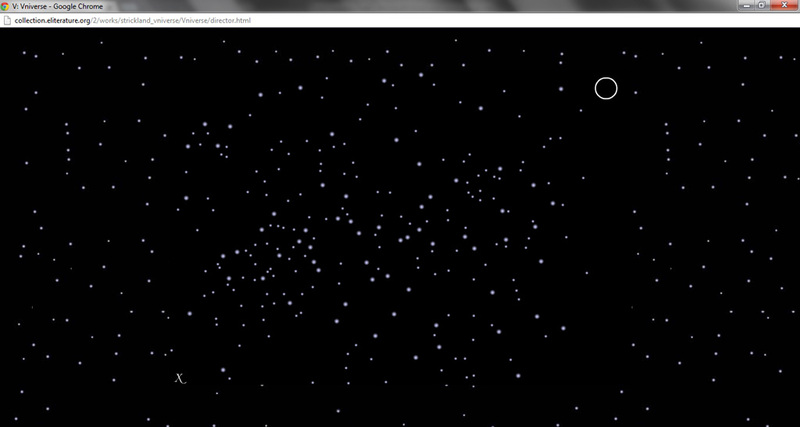 Is it in the Dipper, the Fetus, Infinity, the other constellations?" The reader's body is perhaps the most obvious answer to Strickland's initial question. Strickland likens the activity of sweeping the cursor across the Vniverse to using "finger paint," yet the play of the reader's finger on the mouse pad creates not paint but a series of virtual images. In the following image, the tercet — dislodged from its context — seems like a meta-commentary on the reader's act, not quite a "writing" (that is, a co-authorship) but a "writhing," a movement that nevertheless makes a momentary signature: a diagram of her acephalic self swimming through cyberspace. Adorno, Theodor. Negative Dialectics. Trans. E.B. Ashton. London and New York: Routledge, 1973. Cameron, Sharon. "The Practice of Attention: Simone Weil's Performance of Impersonality." Critical Inquiry 29.2 (2003). Print. Foster, Hal. "An Archival Impulse." October 110 (2004). Print. Jay, Martin. Adorno. Cambridge: Harvard University Press, 1984. Print. Narayana, Vivek. "not nearly novel enough." 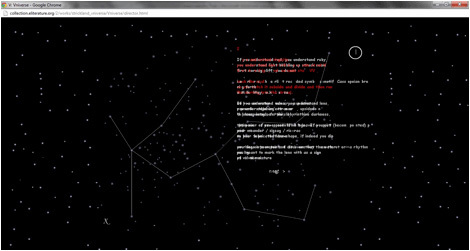 Perihelion 2.7 (2003). 2 March 2013. Web. Strickland, Stephanie and Cynthia Lawson. "Making the Vniverse." 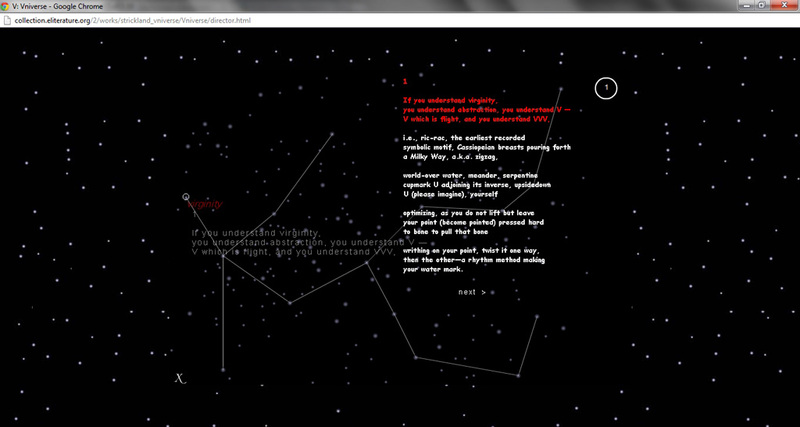 The New River: A Journal of Digital Writing and Art (2003). 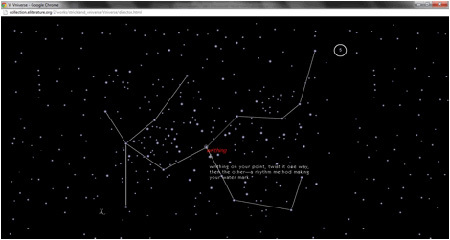 2 March 2013. Web. Taylor, Diana. The Archive and the Repertoire: Performing Cultural Memory in the Americas. Durham: Duke University Press, 2005. Vanberborg, Susan. Paratextual Communities: American Avant-Garde Poetry Since 1950. Carbondale: Southern Illinois University Press, 2001. Print. The source of the transcript is an MP3 file available at the PENNSound archive: «http://www.writing.upenn.edu/pennsound/x/Strickland.html». Michael Leong is the author of several books of poetry, most recently Cutting Time with a Knife (Black Square Editions, 2012) and Who Unfolded My Origami Brain? (Fence Digital 2017). Excerpts from “Disorientations,” his long poem in progress, are forthcoming in Best American Experimental Writing 2018 and Hambone. New critical writing on conceptual poetry is forthcoming in Journal of Modern Literature. A former NEA Literature Translation Fellow, he is Assistant Professor of English at the University at Albany, SUNY.